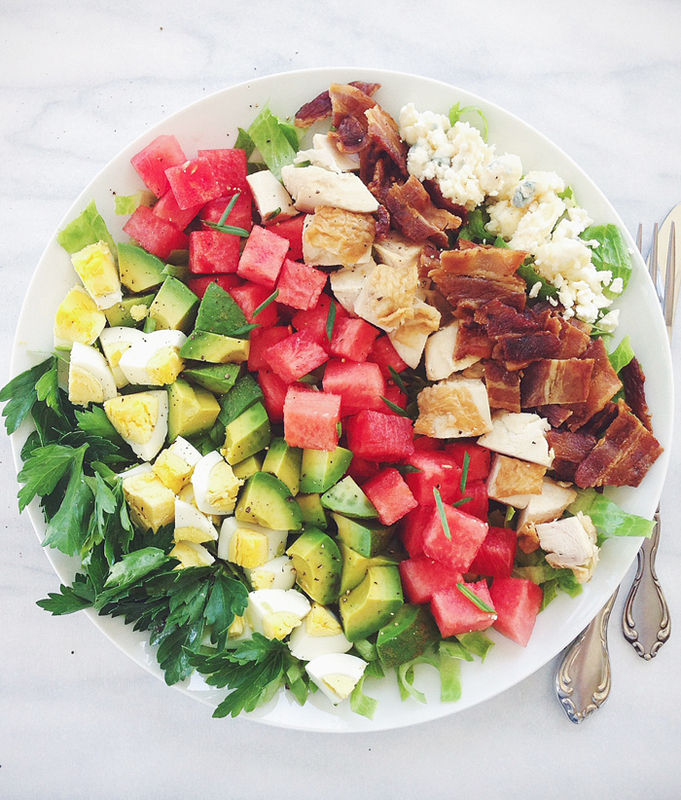 Thank you, bacon and blue cheese, for Watermelon Cobb Salad. This is essentially an Original Cobb Salad with watermelon replacing the tomatoes because the truth is, I don’t know. I ate a variation on this salad all summer. I am still eating a variation on this salad, with ever so slight changes in the ingredients that reflect the season as we go along. Obviously, Pumpkin Spice Cobb Salad is about to happen to this world. Toss the greens with about 2-4 tablespoons of dressing. Place the greens in the bottom of a wide, shallow salad bowl of serving plate. Arrange the parsley, eggs, avocado, watermelon, chicken, bacon, and blue cheese on top of the greens. Garnish with minced shallots, chopped chives, and fresh cracked black pepper. Note no.1: You can arrange all the ingredients first and then drizzle everything with the dressing, but that’s a personal preference. I like to taste each of the ingredients naked. Note no.2: There is no Note no.2. I just want to see if you’re still reading, which you are. Cool. Thanks! This recipe has been re-printed countless times as “The Original” vinaigrette for Cobb Salad. Well, I don’t ever leave well enough alone, so I made a slight modification to the above recipe, using all olive oil, partly for the “health” benefit of olive oil like the health benefit of bacon, but mostly because wtf is “salad oil?” In the end, shake the dressing up to your own picky taste. ~ parsley and chives from my garden!